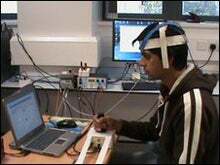 Researchers somehow found volunteers to willing accept electrical shocks while playing video games. Ooook. The study's mostly good news though: Small zaps to the brain might help Parkinson's patients. The bad news? They'd turn us into bad video game players. The current increased the activity of normal beta waves, and slowed the volunteers' reaction times by 10 percent.